After accepting license terms, plugin is ready for use. To activate plugin, right click on project name in Projects view and click on Coverage -> Activate Coverage Collection. To see plugin in action, activate Code Coverage for a project as described above and run Test from context menu. When the execution finishes (it will be fast), we can check the results. 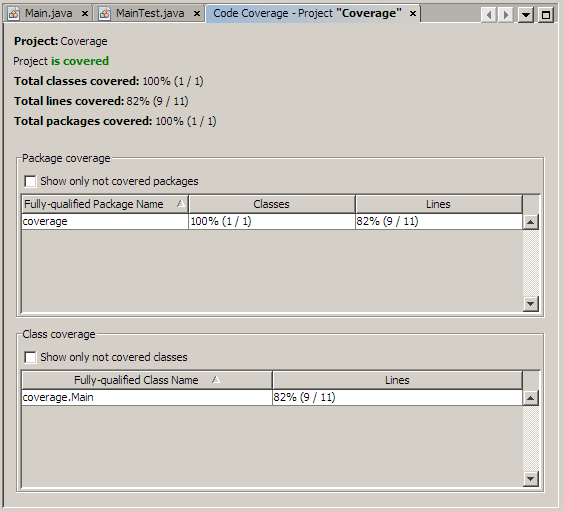 In the report we can check package coverage for classes and lines of code and class coverage for individual classes. If you have problems with installing or running Code Coverage plugin, describe your problem in a comment and I’ll try to help. I can answer in English, French and Spanish. This entry was posted in netbeans and tagged code quality, java, netbeans, tools. Bookmark the permalink. Do you happen to know some way to use this plugin in functional testing a J2EE project with a client? I have a swing client which uses some webservices based on EJB3 classes on the server. I would very like to see what happens coverage-wise on the server side, if I execute something on the client side. The problem seems to be that this plugin only works with one project at a time. EMMA homepage suggests offline instrumentation in case of J2EE projects, but I’m not sure if this plugin can help in that or do I have to do everything manually? what is your app. server? I tried once to do something similar but it didn’t work for me. Now I am testing EJBs and below outside of application server. It is a good solution if there is not a lot of logic in EJB class. 2) On a couple of my projects shows Project *is _not_ covered* in red, although it shows the classes and lines covered and it colors the covered code. 3) On a RMI project shows no coverage at all although the project is covered; there is a line in the coverage output that says that the project contains classes without full debug information (Class_skel). 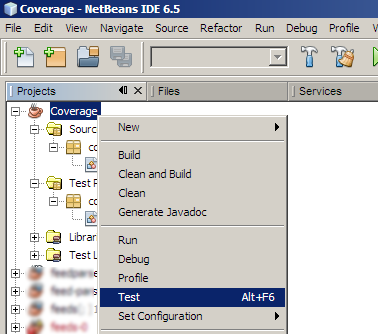 Code Coverage menu is deactivated in case of Netbeans Modules Suite?? How do I test for the complete Netbeans Java GUI application?? Is there any way to run an application in ‘code-coverage-mode’ as it can be done in Eclipse? i.e., without the need of jUnit tests. My problem is that I have a Swing application, which is really really hard to test with jUnit. I’d like to turn on code coverage, exercise my application, turn off the code coverage and get the report. I’ve had good luck testing Swing apps with UISpec4J and FEST-Swing (both open-source). FEST seems to support just about all Swing features, including drag and drop, but the tests run slowly. UISpec4J doesn’t support drag and drop entirely but the tests run much faster. I use UISpec4J whenever possible and FEST when necessary. Hello i have a problem to use this plugin with Netbeans 6.7. When i rght click on a project the coverage choise is unusable . Escuse me but i am french and i can’t speak in english very well. I’d really like to use this in Netbeans 6.7.1. However, after installing the plugin and following your instructions, the ‘Coverage’ context menu for my project does not show. My project is a Maven based project, I guess this is why. Any chance this will work in that combination? Great plugin! Although it seems that the plugin can only be used for java class libraries and not for ejb and web projects. For those kind of projects, the code coverage item on the contex menu is always disabled. Yes, it seems so. Code Coverage plugin is based on Emma (emma.sourceforge.net) and it should be possible to configure Emma to analyze any Java project, including web and ejb. However, I didn’t do that yet. Very nice tool. Do you have any idea how to specify EMMA filters with the plugin? The EMMA documentation shows how to specify filters with command line options or Ant task attributes, but it doesn’t show a way to set filters with a system property. And I can’t find any way to configure the plugin itself. Too bad this plugin does not work with Maven projects. This makes NetBeans despite the excellent support for Maven projects less attractive for Maven projects than Eclipse. I’m trying to use this with some code that I’ve generated via javacc. 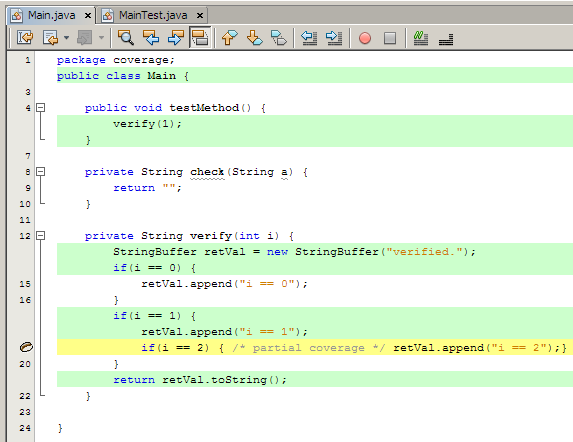 I’ve verified that I see code coverage when I use the plugin on non-javacc projects. So I’ve got a good installation! When I try to run thru the Main in javacc, the coverage file never gets created. Have you heard of anybody else who had problems using EMMA with javacc? I too faced the same problem what Tobias W. faced here. Pls let me know what to do. good article. Thanks. This is exactly what i need to start working with test coverage plugin. Trying to use it with NetBeans 6.9.1. I see “EMMA” collecting data during the testing phase, but when I open classes or look at the code coverage summary, it says that nothing is covered. What am I missing? Try to use different JDK version, for example. At my work we had to go back to JDK 6 update 21 as newer versions didn’t work. Let me know if it worked. 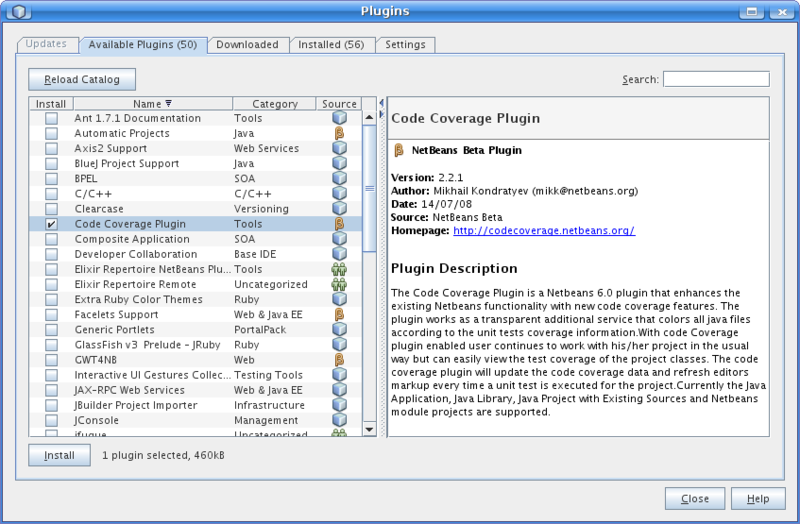 I have installed the ‘Code Coverage’ plugging in my netbeans IDE. The project that I am working on is Maven project. I tried to follow the steps you have given in this site, but I Could not activate the Code Coverage as you mentioned in my project. The Menu item Coverage is coming but it is disabled. 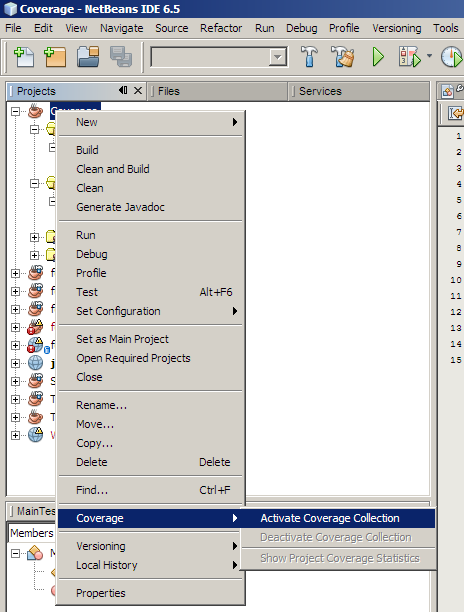 What changes are required to enable to Coverage option for my project ( Maven project).